We’d love your help. Let us know what’s wrong with this preview of Loving Lieutenant Lancaster by Sarah M. Eden. To ask other readers questions about Loving Lieutenant Lancaster, please sign up. 3.5 stars. Loving Lieutenant Lancaster is a charming, sweet and clean Regency romance by Sarah Eden, a well-known author in the clean romance genre who usually gives her main characters personal issues that make her novels a little deeper than the norm for this genre. Arabella is a sweet but previously emotionally abused young woman who’s been taken in by the Jonquil family (from one of Eden's longtime series) as a companion to their elderly mother. Linus Lancaster (from Eden's other multi-book 3.5 stars. Loving Lieutenant Lancaster is a charming, sweet and clean Regency romance by Sarah Eden, a well-known author in the clean romance genre who usually gives her main characters personal issues that make her novels a little deeper than the norm for this genre. Arabella is a sweet but previously emotionally abused young woman who’s been taken in by the Jonquil family (from one of Eden's longtime series) as a companion to their elderly mother. Linus Lancaster (from Eden's other multi-book series) is a former Navy lieutenant who’s haunted by the death of his older brother eleven years ago, unhappy about being the family heir, and a little at loose ends. Arabella feels like she needs to act like a servant at the Jonquil home, despite everyone's inclusiveness. And Linus ... isn't sure how to treat her, but he knows he's interested in this quietly attractive woman. Meanwhile other people are trying to pull Arabella and Linus in different directions, relationship-wise. Fans of Sarah Eden will rejoice in her bringing together the two families she’s been writing about for several years. It’s quite the house party at the Jonquil mansion! All the excitement and drama with secondary characters is fun if you're familiar with them from the prior books, but it will lose some of its resonance if you're a new reader to the two series that come together here. Unless you're invested in the characters already, this one is just a little bland. The main plot with Linus and Arabella is rather slight on its own, so I'd advise reading at least some of the prior books (especially Seeking Persephone and Friends and Foes, the first books in these two series) before jumping into this one. I had to jump into this one when I learned it would bring together the Lancaster series and the Jonquil series. Can you imagine being able to attend that houseparty?? So fun! I loved seeing these two families come together, it was like a reunion of sorts. As much as I loved seeing all these characters together, I did think it took away from Linus and Arabella's story a bit. I would have liked to see them together more. Overall, it was a fun addition to the Lancaster/Jonquil series. Romance I had to jump into this one when I learned it would bring together the Lancaster series and the Jonquil series. Can you imagine being able to attend that houseparty?? So fun! I loved seeing these two families come together, it was like a reunion of sorts. As much as I loved seeing all these characters together, I did think it took away from Linus and Arabella's story a bit. I would have liked to see them together more. Overall, it was a fun addition to the Lancaster/Jonquil series. Oh my heart! I loved this one! Arabella and Linus find something special in each other, but their quick friendship develops into something more so slowly that I was filled with anticipation the entire book. New readers might be a little overwhelmed by all the characters in the Jonquil and Hawthorne families and their connections, but fans of the author will absolutely love seeing more about all their favorites, and it's more than just cameo appearances. There are significant scenes and subplots Oh my heart! I loved this one! Arabella and Linus find something special in each other, but their quick friendship develops into something more so slowly that I was filled with anticipation the entire book. New readers might be a little overwhelmed by all the characters in the Jonquil and Hawthorne families and their connections, but fans of the author will absolutely love seeing more about all their favorites, and it's more than just cameo appearances. There are significant scenes and subplots with Adam and Persephone, Phillip and Sorrel, Mater, Artemis, and especially the youngest Jonquil brother, Charlie. Linus's compassion for Charlie and his genuine friendship with the struggling young man showed his admirable personality and he also benefited with a stronger sense of belonging and purpose. Arabella is also struggling to find her place in new circumstances, and Linus's friendship is like a ray of sunshine in a caring but busy family. Their banter was so natural and full of humor, it was a pleasure to read. I really connected with these characters and highly recommend the book! Ahhhh...Loving Lieutenant Lancaster is a dream come true for fans of Sarah Eden. To have the Lancasters and the Jonquils in the same home... perfect escape novel. I love Sarah Eden's writing style. She has a way of creating as story with humor. I loved the dynamics of this book. Bringing the brooding Duke of Kielder and the flamboyant Lord Lampton in one story is sure to have tempers boiling. I love both of them for very different reasons. But in this story, they are both secondary characters. T Ahhhh...Loving Lieutenant Lancaster is a dream come true for fans of Sarah Eden. To have the Lancasters and the Jonquils in the same home... perfect escape novel. But in this story, they are both secondary characters. This book focuses on the romance of Arabella Hampton and Linus Lancaster. They create their own "club" of "outcasts". They sit on the fringes of society, but don't like to be the focus of attention. They are amazing characters and I enjoyed getting to know them and their histories. This book is a pleasure for Regency Romance lovers. I do suggest that you read the two series featuring the Lancasters and the Jonquils. You can read this as a stand-alone. But to really grasp the story helpful to know the personalities of the families. If you love the Lancaster family and the Jonquil family, you're going to love this book, because the families collide in a house party. Some of my favorite Sarah Eden characters make significant appearances in this story and it's so much fun to revisit them and see what's going on in their lives after their own stories. I've always been of the opinion that true love should know no bounds, no social classes, and no limits. Arabella and Linus develop a sweet friendship that quickly blossoms and spa If you love the Lancaster family and the Jonquil family, you're going to love this book, because the families collide in a house party. Some of my favorite Sarah Eden characters make significant appearances in this story and it's so much fun to revisit them and see what's going on in their lives after their own stories. I've always been of the opinion that true love should know no bounds, no social classes, and no limits. Arabella and Linus develop a sweet friendship that quickly blossoms and sparks with chemistry. I especially enjoyed watching them interact with those around them, as they try and find their niche in both the family circles, as well as society. I loved the way Linus treated Caroline, Oliver, and Charlie. Although they are each younger than himself, he has a way of making people truly feel special. Arabella is so easy to love. If your idea of a house party is sitting around playing whist, sipping tea, and flirting, you'll be in for a few surprises with this one. The plot is entertaining and brimming with lovable characters and interesting twists. I loved being with these families again! This is fourth in a series and characters from the others (particularly the first) are almost overwhelmingly present in this one, bogging it down more than a little. You definitely want to read these in order. Slow. Slow. Slow. Slow. Slow. This is competently written and with engaging protagonists. I very much enjoyed seeing them respond to one another and to see their affections engaged. It was very sweet and since I liked them both immensely, fun. Unfortunately, this book is populated with appro This is fourth in a series and characters from the others (particularly the first) are almost overwhelmingly present in this one, bogging it down more than a little. You definitely want to read these in order. Unfortunately, this book is populated with approximately fifteen million other characters, each with their own troubles and passions and since the main couple can't really be in each other's company much, given the mores of the time, we see every person's trouble and/or passion twice. And that steals all the urgency from the narrative even though it serves to illustrate the virtue and kindness of both main characters. Don't get me wrong, that character illustration trick is a good thing. But it was larded on so heavily I found myself getting bored. Add that both protagonists are being hunted (she demurely, he assiduously) by people I didn't like even a little and I found myself reluctant to come back to the story once I put it down. And since my boredom weighed so heavily, I was tempted to put it down again almost immediately on picking it up. Not a good combination. I really liked Linus. He may be my favorite Eden hero so far. I love how he understands and interacts with those around him. He challenges them just enough, but not so much that it’s obnoxious. Arabella was understandably quiet, and I liked the balance she had of keeping to herself but allowing conversation when she was at ease. There romance was so sweet and it was fun to see so many characters from previous books. Really cute. Loved seeing all the characters together. I absolutely love the Lancaster family! This series as well as the Jonquil family are go to reads for me. I love that the author has continued on with the different family members and letting us readers keep having fabulous books to read. My favorite part is that previous characters are still showing up in each subsequent book. I've grown connected to these characters and it makes me so happy to see that their lives are still continuing on and that they're happy. I know they're fictional. But I I absolutely love the Lancaster family! This series as well as the Jonquil family are go to reads for me. I love that the author has continued on with the different family members and letting us readers keep having fabulous books to read. My favorite part is that previous characters are still showing up in each subsequent book. I've grown connected to these characters and it makes me so happy to see that their lives are still continuing on and that they're happy. I know they're fictional. But I still love them! I really enjoyed Linus' story. It was a sweet love story with many insecurities on different characters' parts. They had learning and healing to experience. There were plenty of humorous moments throughout this book. I loved all the moments with Adam, or the Dangerous Duke! He and Persephone have been some of my favorite characters in the Lancaster family series. So if you're like me and a fan of Adam's, then be prepared for many humorous moments with him. He's his same old dangerous self. I received a copy from the publisher, Covenant Communications, via NetGalley. All thoughts and opinions in the review are my own. I also listened to the audiobook through Deseret Bookshelf. The narrator was fabulous! One of the things I love best about Sarah Eden's books is how she makes characters come alive. They are real to me; flawed, hurting and sometimes broken but no matter how they come, I always end up loving them. By the end of the book I feel as though I know these cha I always, always look forward to Sarah Eden's books. My heart and mind have come to know exactly how her books feel because Sarah Eden's book definitely do have a certain feel to them. It's so gentle and the words flow effortlessly. This book is about Linus. He has retired from the Navy and really doesn’t want to do the job that his older brother, who passed away 11 years ago should be doing. Linus is a wonderful person who truly ca I can’t get enough of the Lancaster’s and the Jonquil’s!! Putting the two together had me laughing! The Dangerous Duke and Lord Lampton are so opposite and oh how they go at it! Now given the brother-in-laws the job of making sure they do not kill each other just makes me giggle even more inside! I was late to the Jonquil party and I'm late to the Lancaster party too, but it's not because I didn't want to join in on all the fun. So when I saw this on NetGalley I wanted to request it, but knowing it was #4 in a series I was hesitant because I thought I'd be lost. I asked a good GR friend, if she thought I'd be too confused jumping in by reading book #4 and she said no, the author does a good job of reminding the reader who the other characters are. So, I requested the book, was approved a I was late to the Jonquil party and I'm late to the Lancaster party too, but it's not because I didn't want to join in on all the fun. So when I saw this on NetGalley I wanted to request it, but knowing it was #4 in a series I was hesitant because I thought I'd be lost. I asked a good GR friend, if she thought I'd be too confused jumping in by reading book #4 and she said no, the author does a good job of reminding the reader who the other characters are. So, I requested the book, was approved and happily jumped into this book that meshes a lot of the Lancaster sisters and the Jonquil brothers. I loved this story even though at first I had a little trouble remembering who was married to whom. I know I said I loved Crispin when I read The Kiss of a Stranger, but now I love Linus too! Who couldn't love this thoughtful, gentle, funny man? Arabella Hampton, Linus Lancaster, and Charlie Jonquil all feel, to a degree, that they don't fit in with their families but in different ways, and for different reasons. All have experienced the loss of at least one parent at a young age, and they've all recently had changes that they're trying to adjust to. All of them are trying to find their place in the new stage of their lives. As Arabella told Linus "Life is far more difficult when one is forced onto a path not of one's choosing." Arabella is now Mater's companion, and she's not sure what her place is, as she's not really a servant, but she's also not family, although she's known them since she went to live with her Uncle and Aunt when she was very young. I felt for Arabella so much with her cruel Uncle and Aunt. A lot of Regency/Victorian stories have these poor people who are taken in to be cared for by terrible relatives and these are hers. I never understand why they take in the orphaned children if they're going to treat them so cruelly, AND they're flesh and blood! Thank goodness these people didn't have children of their own. Linus Lancaster has recently retired from the Navy and isn't quite sure what to do with himself. He doesn't look forward to becoming a landowner and all the responsibility it entails, being the second son he didn't think the duty would ever be his. He also still mourns the loss of his older brother, Evander, even though it's been eleven years since his death, and wants to avoid the memories their estate holds. He goes to Mater's house party to keep Adam, the Dangerous Duke, from killing Lord Lampton (Philip Jonquil), or letting Adam do something to upset his wife, Persephone. Charlie Jonquil's a little of a side story but it does involve Arabella and Linus. Charlie, the youngest Jonquil, is home from University and doesn't know what he wants to study or where he fits in with the rest of his accomplished brothers. He and Linus strike up a friendship and Linus takes him back to his estate in Shropshire. This was such a delightful read. These two families together with all their different personalities kept me thoroughly entertained. Adam who can and does say whatever he feels, Philip the outlandish Lord who irritates Adam on purpose, Linus' matchmaking sisters--Athena and Artemis, and of course Mater. No wonder everyone wants to be a part of this family. I loved the humor that's there from the first chapter. There's so much love in this story--Arabella's love for the Jonquil family, Mater and her love for Arabella, Linus showing love and care to Caroline and Oliver, and understanding and a listening ear to Charlie. This is such a heartwarming story and sure to be one of my favorite books. Most readers of the Jonquil & Lancaster family series will by now be eagerly awaiting every release, loyal fans, waiting for a chance to be back amongst friends. With 9 books between the two families, we know them intimately, and it truly feels like going home. Back to Falstone Castle, Lampton Park. Even though we usually get some kind of cameo appearance in each book by members of either family - 'Loving Lieutenant Lancaster' spectacularily intertwines both families on a grand scale like we Most readers of the Jonquil & Lancaster family series will by now be eagerly awaiting every release, loyal fans, waiting for a chance to be back amongst friends. With 9 books between the two families, we know them intimately, and it truly feels like going home. Back to Falstone Castle, Lampton Park. Even though we usually get some kind of cameo appearance in each book by members of either family - 'Loving Lieutenant Lancaster' spectacularily intertwines both families on a grand scale like we haven't seen before. Every element is there. Sarah is a master of not only regency writing, but she takes you on an incredible journey of emotion. The thoughts and actions of her characters draw you in, with every aspect of a personality, be it humor, anger, sadness, joy - the list could go on. Everyone’s favourite Duke is back and performing true to form! Once we arrive in Lampton, Linus passes Arabella in a darkened hallway & the connection between them begins. His character is one of such thoughtfulness & kindness. I loved his character, the way he makes time for those who seem to live life on the fringes of the group. Both his & Arabella’s instropective ways lend to some thoughtful and touching scenes. I enjoyed their interactions with the second generation, & it enabled some great moments in the story. Their formation of a ‘club’ was amusing and clever. Along with the obvious development of their friendship, which felt easy and natural - we are taken on a journey into their past, without endless passages of 'memories'. I loved that! We discover how Arabella became such a pivotal part of the Jonquil family, without the need to question her exclusion from earlier storylines. In fact I love, LOVED the backstory, and the role the late earl of Lampton had played in the very difficult childhood she found herself in. The tender moments she shares with Mater, were so very sweet. I always appreciate when the story gets taken to Lucas, with him being an absent character, it once again shows how he has seemingly had such a significant impact on each of his children, and those who crossed his path. Even Adams references to him during his time at Lords was enlightening. I'd love to see a story written about the Earl & Mater! We are given little glimpses into their happy life, and Mater alludes to their courtship not being an easy one... please oh please Sarah write their story!! What did I especially love about this book? The personal friendships & connections made between individuals. We get a lot more from Charlie, and how I love his character. It's clear there is more to come with Artemis, and his new kinship to Linus opened a doorway into his life we haven't previously seen. So many moments to laugh and smile. These families hold a secure part of my heart. Great scenes between Adam & Philip. The opportunity to go deeper into real life struggles years on from earlier unions just adds to the depth and authenticity of the writing. I especially love this cover, because even when the main character from these families are male, so far we are always given a cover of a lady. This is the case for many historical fiction novels. Its such a clever and refreshing change. Love it! This book is everything!! Phillip and Adam, perfect!! Charlie and Artemis, perfect! Linus and Arabella, perfectly perfect. Nothing could have been more perfect than joining these two families together. I ship Charlie and Artemis so hard and super super hope that my hopes and dreams for them wont be shattered!! I am gushing but I loved this book SO. MUCH. The Lancasters and the Jonquils together! Yay!! I have read all of the books in the Lancaster series and in the Jonquil series, and I love these two families! Having them come together in a book was a dream come true. And it lived up to the dream! At the heart of the book is the story of Linus and Arabella. It was wonderful to get to know Linus better! He is intuitive, unselfish, hard working, and great with kids. He is quite a catch! Arabella is unassuming and kind. She has such a tender connect The Lancasters and the Jonquils together! Yay!! I have read all of the books in the Lancaster series and in the Jonquil series, and I love these two families! Having them come together in a book was a dream come true. And it lived up to the dream! At the heart of the book is the story of Linus and Arabella. It was wonderful to get to know Linus better! He is intuitive, unselfish, hard working, and great with kids. He is quite a catch! Arabella is unassuming and kind. She has such a tender connection to the Jonquils. I loved Linus and Arabella together! They were perfect for each other. Now...Adam and Philip. I must admit that seeing their interactions was what made me the most excited about a book including both families. Oh, my! Did that ever live up to expectations! I also loved seeing or hearing about other members of the families. I just love them all!! Linus was awesome. I seriously love his character. Arabella was really likeable too. The love story was sweet. I loved that so much of this story included the Jonquil family, as well as Persephone, & Adam. It was great to "catch up" with them, & to get to know Charlie Jonquil & Artemis Lancaster. Recommends it for: those who enjoy Ms. Eden’s series. 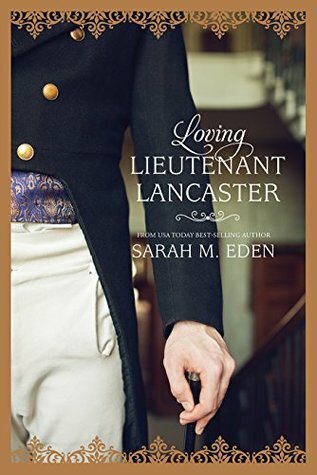 Loving Lieutenant Lancaster (The Lancaster Family #4) by Sarah M. Eden is a Regency romance where Ms. Eden has the two families (Lancasters & Jonquils) whose individual series are written by Ms. Eden gather for a two week house party! Included in this house party are a young retired Naval officer, Lt. Lancaster, and a lonely young woman, Arabella Hampton, who being “the unwanted and unloved charge of a cruel aunt and neglectful uncle” has now become the lady ‘s companion of the dowager count Loving Lieutenant Lancaster (The Lancaster Family #4) by Sarah M. Eden is a Regency romance where Ms. Eden has the two families (Lancasters & Jonquils) whose individual series are written by Ms. Eden gather for a two week house party! Included in this house party are a young retired Naval officer, Lt. Lancaster, and a lonely young woman, Arabella Hampton, who being “the unwanted and unloved charge of a cruel aunt and neglectful uncle” has now become the lady ‘s companion of the dowager countess of the Jonquil family at Lampton Park, the location of this delightful house party. Both characters must deal with ghosts of their pasts, but when they meet, smiles and laughter occur! DNF 50%, no star rating. Calling it quits. Too much focus on couples from previous books. The H and h are boring and there’s no spark between them. Meh. Sarah Eden is hit or miss for me. I so enjoyed this story! Mixing the Lancasters more with the Jonquil family. This is not really a stand alone novel. Reading the Lancasters and Jonquil line of books before this one is a really good idea. I received a book mark from her signing that gives the reading order of each, I'll put that at the bottom of my review. This is the story of Linus Lancaster and Arabella Hampton. A very sweet story of two lost people trying to find there place in the family and world. The banter between them is I so enjoyed this story! Mixing the Lancasters more with the Jonquil family. This is not really a stand alone novel. Reading the Lancasters and Jonquil line of books before this one is a really good idea. I received a book mark from her signing that gives the reading order of each, I'll put that at the bottom of my review. This is the story of Linus Lancaster and Arabella Hampton. A very sweet story of two lost people trying to find there place in the family and world. The banter between them is so great. It is a believable story line with all the right elements of a great regency read. Very Chaste. Jonquil Family book Reading order: Kiss of a Stranger, Friends and Foes, Drops of Gold, As You Are, A Fine Gentleman, Love and Honor. When I saw this book at my local book store I wanted to do a happy dance. I didn’t know that Sarah Eden had a book coming out before her next Hope Springs installment in the fall. This book was great! The Jonquil family and the Lancaster family together. Yay! This was by far my favorite of all of Sarah Eden's period novels. I related well to the characters and their honest, genuine emotions. This novel features two series that are blended together, and loved how it pulled these two series together. S.E. really characterized these characters well and put me in their heads with their insecurities, foibles, faults, and of course, and more importantly for me, their thoughts and emotions. Pleasure to read, lovely chemistry, and of course, always a pleasure to revisit these two families in these two series. It was lovely to see more of the Jonquil mother's point of view, and witness her beautiful heart and character. I would never want to read just one author for the rest of my life. But I think if I had to choose one, it would be Sarah M Eden. I love her books! I love the way she writes. Her books are so fun! I love her characters. I love the settings. Really just everything about her books are amazing! This one is just awesome! As the Loving Lieutenant Lancaster by Sarah M Eden opens, you have Adam, Duke of Kielder calling a meeting of his brother in laws, Linus and Harry. He has a problem. Persephone is in I would never want to read just one author for the rest of my life. But I think if I had to choose one, it would be Sarah M Eden. I love her books! I love the way she writes. Her books are so fun! I love her characters. I love the settings. Really just everything about her books are amazing! This one is just awesome! As the Loving Lieutenant Lancaster by Sarah M Eden opens, you have Adam, Duke of Kielder calling a meeting of his brother in laws, Linus and Harry. He has a problem. Persephone is insisting that he go to a house party, for 2 weeks! My thought as I was reading this very opening chapter was, yes Adam! I love Adam. He’s snarky, with a dry wit that I love. He says everything I would ever want to say that is mean to people. And he gets away with it! It was really fun to get to see Adam, and a little different side of him in this book. Adam isn’t a main character, so the reader doesn’t see what he’s thinking. Adam pretty much says whatever he thinks anyway. The main two characters in this one are Linus and Arabella. But the way this one is written the reader gets to see all of Adam’s family and all of the Jonquils. I love the way the worlds of the two families collide in this one. All of the secrets going on between the two families really make the whole plot work so well. Linus…I loved Linus! He goes to the house party at the behest of Adam. He goes so that Adam doesn’t kill Lord Lampton, Philip Jonquil. I love the way everyone, Adam and Linus, are afraid of what Persephone will do if Adam messes up and injures or maims anyone. Linus goes out of his way to get to know the girl who seems to want to be left in the shadows at the house party, Arabella. I love his gentlemanly ways. He made me love him when he included young Caroline Jonquil in the activities when he didn’t have to. Arabella has just been hired to be Mater’s companion. She immediately becomes the one that everyone tells their secrets to. But she’s not quite sure where her place is. She’s known the Jonquils her entire life and feels a bit out of place. I love the way she grows in confidence throughout the book, except where it comes to Linus. There are a lot of things going on behind the scenes that Arabella hadn’t known or realized. And when all is revealed, I about cried. It was so beautiful! I've been trying to get my hands on this before it even came out, and it's been ages since I've felt this excited to start a book. It certainly didn't disappoint, but neither did it really amaze or fascinate me. Seeking Persephone is still my favourite Lancaster, but this one is quite good too. I suppose I'm starting to prefer a little less romance and more focus on the family itself, which was there, but still not enough for me. I think this is what makes me more eager for Eden's next book. I ju I've been trying to get my hands on this before it even came out, and it's been ages since I've felt this excited to start a book. It certainly didn't disappoint, but neither did it really amaze or fascinate me. Seeking Persephone is still my favourite Lancaster, but this one is quite good too. I suppose I'm starting to prefer a little less romance and more focus on the family itself, which was there, but still not enough for me. I think this is what makes me more eager for Eden's next book. I just can't wait for the Charlie & Artemis book. The Humor. The Drama. The Just Plain Fun. So , in brief, as Mr. Micawber says, I'm too lazy to write a proper review. Another great read from Sarah M. Eden. This book is particularly fun because it combines so many of her wonderful characters into one place. As readers, we get to see the couples we love and find out more about what has happened to them since their story ended, which is wonderful. And do not get me started on the showdown between Phillip Jonquil and the Dangerous Duke. Hilarious. Really, laugh out loud. As for this couple, I loved them both. You can't help but adore both of them and cheer when th Another great read from Sarah M. Eden. This book is particularly fun because it combines so many of her wonderful characters into one place. As readers, we get to see the couples we love and find out more about what has happened to them since their story ended, which is wonderful. And do not get me started on the showdown between Phillip Jonquil and the Dangerous Duke. Hilarious. Really, laugh out loud. As for this couple, I loved them both. You can't help but adore both of them and cheer when they finally get together. There's lots of heartache and happiness, along with a heavy dose of the Eden witty banter, so it's great fun all around. I love this series and was not disappointed by Linus’ story. This book is extra fun, though, if you’ve read all the previous books from both the Lancaster family and the Jonquil family. In fact, if you haven’t, you should go read all of those first. It’s always exciting getting to catch up on the other characters but Linus and Arabella held their own and really had a great relationship and fun banter between the two of them. I look forward to reading the next books about the other siblings...and I love this series and was not disappointed by Linus’ story. This book is extra fun, though, if you’ve read all the previous books from both the Lancaster family and the Jonquil family. In fact, if you haven’t, you should go read all of those first. Linus Lancaster has retired from his naval service at the ripe old age of 24 years of age. Now that he is back on land, he is bored and at loose ends as to how to fill his time. So, when an invitation to a two-week long house party in the country is received, he quickly accepts. He knows his duty will be to keep his brother-in-law, Adam, apart from the dandified Philip. Once he arrives, his sisters who are also in attendance, begin scheming to find Linus a wife. Linus is not interested in the women they thrust under his nose, but he does meet someone who quickly becomes very important to him. The host of the house party is an older woman in the aristocracy who has employed a companion, Arabella Hampton. Arabella Hampton is overjoyed with the opportunity to return to the estate of her favorite earl. He has since passed away, but she remembers all the times he acted kind to her and treated her like a daughter. She has been orphaned since the age of six and has been living with an aunt and uncle who made no qualms about making it obvious to her that she wasn’t wanted by them. Now, Arabella has the chance to escape their harsh treatment of her and be near the Jonquil family whose children she grew up with, living close by. Arabella longs to be loved and included in a family as she has always felt invisible. The instant Linus and Arabella meet there is a spark of attraction, but she is barely above the social status of a servant and Linus is much higher up the scale. He won’t even consider her as a romantic interest, will he? First, the negatives of the story in my opinion were few, but the story dragged somewhat and there wasn’t enough interaction of the two main characters. They took forever to finally declared their love for one another. The ending of the story was just okay as there was no real tension or big build up. Now, the positives were the hilarious interactions between Adam and Philip, two characters from prior books. There were definitely some laugh out loud moments. The snappy dialogue and witty comments were excellent. The time period is also one of my favorites as well as the English countryside descriptions. I also liked the interaction between family members and the interesting dynamics thereof. These books are not labeled as a series, so I didn’t realize there were other prior books. I plan to return to those to get caught up on the background/stories of the other Lancaster and Jonquil family members.